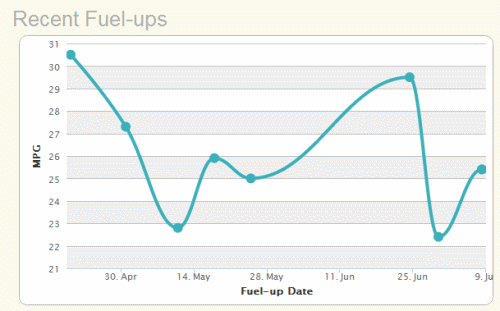 In May, I ran a Fuel Challenge that was motivating me to improve my own gas mileage and to get others to do the same. Not only did I pick up some tips, I also liked having a way to track my gas expenses. I decided to do a monthly review to keep tabs. Gas prices having been decreasing during the past month. Most of my fuel ups have been in the $3.20s/gallon range. When we were in Virginia I snagged a fuel up for $3.12/gallon. I thought that would be the lowest price I’d get last month, but I was wrong. My last trip to the gas station in June had me filling up at $3.10/gallon. Right now in Raleigh gas prices are around $3.11-$3.21/gallon, depending on what part of town I’m in. My best miles per gallon performance came from my trip to Virginia with mostly highway driving. I got 29.5mpg – much better than my average, but still a bit lower than I’d like. The good news is I had a wonderful interview with a fellow Fuelly user about tips to improve gas mileage. Anyone can drive like a maniac. IMO, driving smoothly is the mark of a good driver. Driving smoothly, as it happens, also leads to better MPGs… For example, I look far ahead when driving; if I see a red light I’ll slow down and time my arrival to avoid coming to a full stop. Most car manufacturers want lower tire pressure for a smoother ride, but keeping them at higher pressures gives better mileage and is better for the tires and rims, anyway (lower tire temperatures on the highway and less likelihood of damage via potholes). Check out the link above for the fuel interview on Couple Money. I’m interested in how you’re doing with your gas mileage over the last month. What are gas prices in your area? What has been your gas mileage for the past month?